As our awareness grows of humanity’s harmful impact on the Earth, it is ever more important to learn the principles and skills necessary not only to lessen our negative impact on the planet, but to learn to enhance the vitality and beauty of the natural world, working instead with Nature’s genius. In this revealing, five day workshop, we will use hands-on design and implementation of Permaculture and Biodynamic principles to transform a 6.5 acre homestead in New Lebanon, NY, the site of The School of Living Arts, an ecological consciousness center in the Berkshire/ Hudson Valley region of New York. * Advanced techniques for site assessment and whole site design. Naturally occurring local features as the basis of design. The natural history of Eastern woodlands—an understanding of bioregionalism (as opposed to politically mapped out territories) and where we are; designs that cooperate with their regeneration and create opportunities for locally based economies. Afternoon: Field Trip to the “Shaker Swamp”-- historical wetlands in New Lebanon explored by the Indians and then taught to the Shakers. Here we will identify wild varieties of herbs, as well as trees and other features. We will do the same on the property and consider cultivation of under story crops (ginseng, cohosh, goldenseal, medicinal mushrooms which can be the basis of cottage industries); grants for this; sustainable forest management practices (selective cutting and logging). . .
Resource Day: Integration: Where do we go from here? How to follow through applying what you have learned in your own lives. Career change, goals articulation, counseling students, land development, networking, apprenticeships, resources. Give out contact sheet. On Friday Aug 28th, we will be ending at noon, so that people can get on the road to return home by nightfall. 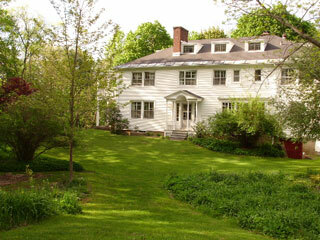 Powell House Retreat and Conference Center, Old Chatham, NY (15 minutes from workshop location) Run by Quakers. Lovely rural setting. For reservations, call: 518-794-8811 ext. 10 or email buffy@powellhouse.org and make sure to reference this workshop in your message. 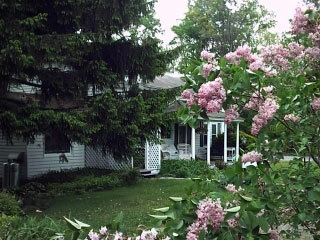 Shaker Meadows Bed & Breakfast, New Lebanon, NY. 8 minutes driving distance from workshop location on Rt 22. For reservations, call 518-794-9385 or email shakermeadows@surfbest.net. Be sure to mention this workshop when you call as we have a special rate. Deadline forreservations and full payment is July 23rd. Meals: Lunch and dinner are extra. We'll have a feast on the last evening on the School of Living Arts grounds (for which we'll all chip in); other evenings we will have a choice of dining out in New Lebanon or, if you are lodged at Shaker Meadows, you can take your evening meal there ($16 per person). You can also purchase a nutritious brown bag lunch from Shaker Meadows or do some food shopping in town. New Registration Deadline and Cancellation Policy: The new deadline for registration and payment in full is August 10, 2009. Tuition is fully refundable up until August 10th with no penalty. After that date, your tuition will be refunded in full if we can fill your space. Sorry, we cannot accommodate pets on the School grounds.